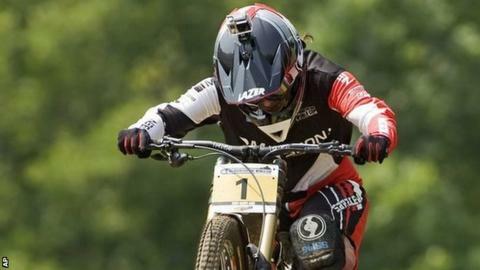 Manon Carpenter has won mountain biking's World Cup Series after a third-place finish in the final round in Meribel, France. The 21-year-old ended the seven-race series on 1,360 points, ahead of Rachel Atherton and Emmeline Rogot of France. "It's passed my expectations," Carpenter said. "It's more than I hope for at the start of the year. It's pretty awesome. "I would have really liked to have finished winning the last World Cup but I was pretty nervous and happy that I stayed on my bike and didn't throw it away." Caerphilly's Carpenter will now aim for success at the World Championships in Hafjell, Norway from 2-9 September. There was also a British winner of the men's competition as Englishman Joss Bryceland finished third in France to secure the overall crown.